There’s no real argument about whether or not Michael Phelps is the greatest athlete to ever put on a pair of swim goggles, or even compete in the Olympics, or do anything, ever. But what does remain to be decided is what Phelps greatest legacy will be in the sport of swimming. Phelps talked often about expanding the horizons of the sport, of bringing more awareness to it, of bringing it to the masses. As was evidenced by the disappointing attendance marks set at Nationals last month, the first National championship meet not featuring Phelps since 1999, the sport is going to miss the awareness and interest Phelps drew. For the casual sports fan, swimming can be a difficult sport to watch. You don’t really see the athletes faces as they splash back and forth, they swim large portions of the race underwater, and in races like the 50 it’s impossible to judge a winner without looking at a scoreboard. Michael Phelps was a superstar – and the casual sports fan loves a super-star. It’s engaging and enthralling to watch someone at the peak of their sport, an athlete that casually dominates their peers. Jordan had it, Woods has it, Phelps has/had it. In 2009 when Indianapolis last hosted Nationals attendance was nearly triple what it was this year. At that meet Phelps set a world record in the 100m butterfly, no easy feat given that he was less than a year removed from the masterpiece that was Beijing. 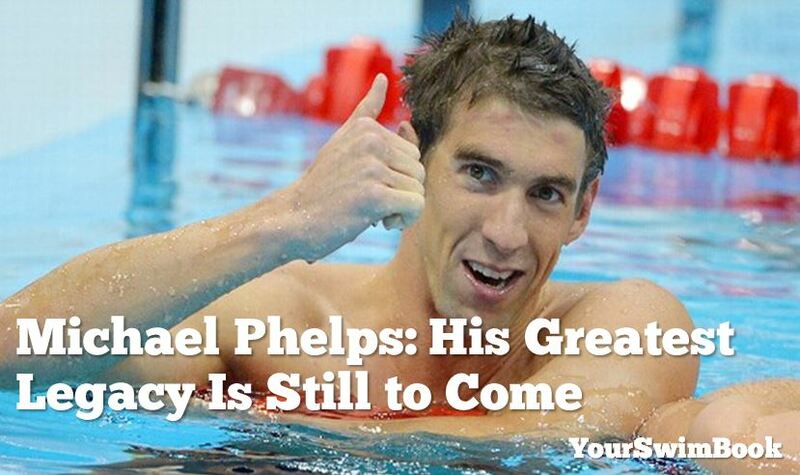 However, Phelps most long lasting legacy is still to be written. Beyond all of the gold medals, and the talk about Phelps’ height, wingspan and more, it will be the next generation of swimmers that will be his true legacy. It won’t necessarily be the records, the incredible swims, or the wall-to-wall coverage. It will be in the tens of thousands of up-and-coming swimmers who joined the sport in each post-Olympic year in the United States. While a bump is expected in a post-Olympic year, it is likely that a great proportion of those new members of USA Swimming were prodded into strapping up a Speedo after the massive coverage Phelps was generating at the pool. There will never be another Phelps. There will instead be Lochtes, Franklins, and a host of other swimmers who will develop to dominate on the international stage. And those classes of swimmers, who will in turn inspire another set of young talent, will be the greatest legacy that Michael Phelps could hope for.